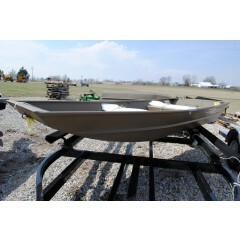 Jones Bros Marine, located just east of Kansas City in West Central Missouri, is proud to offer a wide selection of G3 fishing boats. Through a total team approach, G3’s family of craftsmen, many of whom have been in the industry for decades, consistently produce boats with better fit and finish, outstanding on-water performance, and ultimately, higher customer satisfaction than any other aluminum boat line in the industry. G3 Boats has received the highest level of industry Customer Satisfaction award for more consecutive years than any other aluminum boat manufacturer. As a Yamaha Marine company, you can trust that building quality product is a daily focus at G3 Boats. Jones Bros Marine of West Central Missouri is proud to offer G3’s superior quality fishing boats to the greater Kansas City area. When you consider buying an Eagle bass boat, Angler Deep-V, or Gator Tough Jon boat, you have the satisfaction of knowing that G3’s boat-builders, from the manufacturing floor to the management staff, are family boaters and fishermen, just like you. G3 and Jones Bros Marine measure their success by your success on the water, and continuously strives to provide three key features for every G3 boat owner; Quality, Performance, and Satisfaction.